Barbara Kuehm was born in Schillersdorf, Alsace-Lorraine, on 27 February 1870, the daughter of Michael and Elizabeth (Miller) Kuehm, sometimes spelled Kuhm. Barbara’s parents were also born in Alsace-Lorraine   and the family immigrated about 1873. The Kuehms attended church at Zion Chatt and Barbara was confirmed there on 6 April 1884. Barbara was the sixth of seven known children born to Michael and Elizabeth. I have not been able to locate Barbara and George in the 1900 census. Barbara’s father Michael Kuehm died in 1909 and in 1910 Barbara and two children lived with her widowed mother Elisabeth Kuehm. Their household in 1910: Elizabeth, 83, head; Barbara “Phizer”, 40 daughter; Hilda [Pfeifer], 8, granddaughter; and Carl [Pfeifer], 6, grandson. The census indicates that Barbara was married but her husband George was not enumerated with them. Barbara’s mother Elizabeth (Miller) Kuehm died two years later, in 1912. Barbara’s parents Michael and Elizabeth Kuehm are also buried in Zion Chatt’s cemetery. 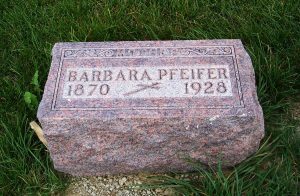 Barbara (Kuehm) Pfeifer died of cardiovascular renal disease on 25 June 1928 in Van Wert at the age of 58 years, 2 months, and 28 days, after suffering with the illness for three years. 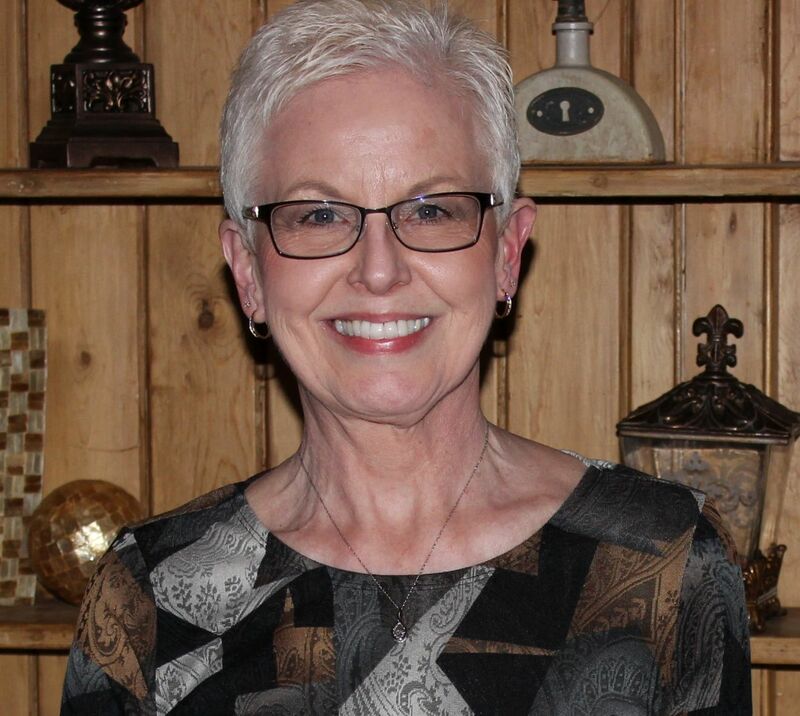 Barbara was a housewife and had resided in Van Wert for 13 years. Her address was 414 N. Cherry Street. Her husband George was the informant for the information on her death certificate. Barbara was buried on 27th. Barbara’s death information was not recorded in Zion Chatt’s records. 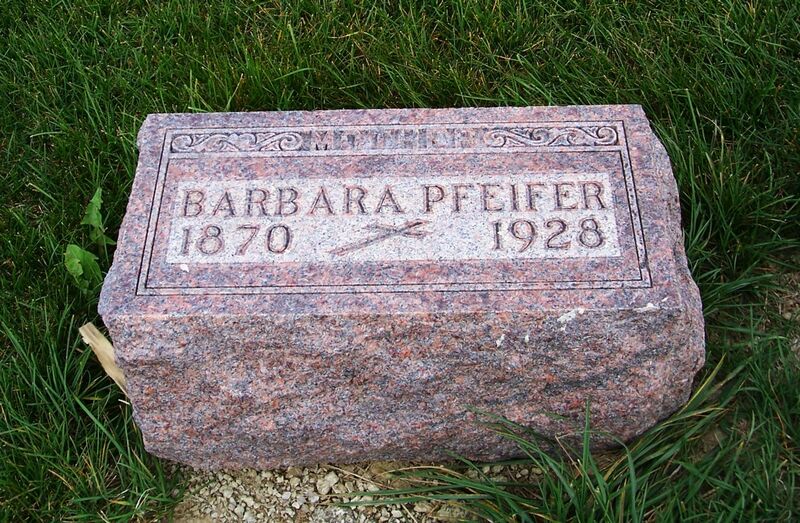 Barbara’s husband George Peifer died in 1945 and is buried a couple rows from Barbara. “Ohio Deaths, 1908-1953,” database with images, FamilySearch.org, Barbara E Pfeifer, 25 Jun 1928; Van Wert, Van Wert, Ohio; FHL microfilm 1991301. “Ohio, County Death Records, 1840-2001,” database with images, FamilySearch.org, Barbara E. Pfeifer, 25 Jun 1928; Van Wert, Pleasant Township, Van Wert, Ohio; FHL microfilm 1952878. 1900 U.S. Census, Jefferson, Adams County, Indiana, ED 4, p. 11B, dwelling 203, family 203, Michael Kuehm; digital image by subscription, Ancestry.com; from FHL microfilm 1240357, from NARA microfilm T623, roll 357. 1880 U.S. Census, Jefferson, Adams County, Indiana, ED 133, p. 6B, dwelling 50, family 50, Michael Kuhm; digital image by subscription, Ancestry.com; from NARA microfilm T9, roll 263. “Indiana Marriages, 1811-2007,” database with images, FamilySearch.org, Geo Pfeifer and Barbara Kuehm, 25 May 1899; Adams County Marriages, Vol. I, p.77; FHL microfilm 2321357. “Indiana Marriages, 1811-2007,” database with images, FamilySearch.org, George J Pfeifer and Barbara Kuehm, 25 May 1899; Adams County Marriages, Vol. G, p.495; FHL microfilm 2,321,629. 1920 U.S. Census, Van Wert, Van Wert County, Ohio, ED 130, p.9A, dwelling 214, visited 223, George R Pfiefer; Ancestry.com; NARA microfilm T625, roll 1446.